When it comes to owning a home, every homeowner quickly becomes aware of how easily expenses can add up trying to renovate, restore or even maintain a property. The real problem can lie in deciding what is worth doing DIY and what is better left to a professional. So what about a home security system? There are many ways in which it would benefit doing DIY home security systems and many ways it would be best to hire a company to install one for you. It’s always best to go over all of the pros and cons to each before deciding what is best for you and your home. No contract. One of the biggest pros to using a DIY security system is that they don’t come with any multi-year contract to lock you down. Most of the time you can opt-in for service or cancel at any time without the hassle or termination fees associated. Inexpensive. DIY home security systems come in a variety of styles and features, and different brands include starter packages as low as $150. Portable Security. If you ever decide to move this system can easily be moved from place to place. 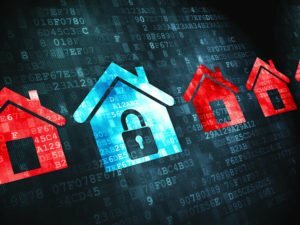 This is especially beneficial for renters who might not have the option for a security system otherwise. Wireless. Most DIY home security systems are wireless, making them easy to install and move around your home as you wish. Online monitoring and cell phone alerts. Many DIY systems offer features that allow you to operate it and other parts of your home through your phone. These “smart home” features let you control things like your lights, your temperature, and more. Add-ons add up. All of the extra add-on components you might need can get pretty spendy when it’s all said and done. Depending on what brand and which kit you purchased, you probably won’t have all of the window, door, and motion sensors you need to feel secure in your home. Each additional window sensor can cost $20+ which adds up quickly in a multi bedroom house. No call to the police. The biggest advantage to a monitored security system is the direct connection to the police. The police and/or the fire department are contacted in case of an emergency. DIY home security systems do not have the option to contact authorities for you, leaving it your responsibility to make that call. Basic features. A home security company will have a lot of high tech options that go beyond their basic packages. Fire monitoring, panic buttons, carbon monoxide monitoring and many others are all great features that a security company can offer you that a DIY system just doesn’t have the capacity for. Limited warranties and support. The adage is true; you get what you pay for. DIY security systems won’t have the same support for broken or malfunctioning equipment. You will be responsible for repairs and for installing your system correctly. Pay extra for monitoring. Professional monitoring can cost between $10-50 extra a month, that is if the product you purchased offers it. High-tech features. Home security companies such as 4Sight Security in Idaho Falls, ID offer a long list of optional features to help customize the security of your home and your valuables. Having a professional to guide you could help you cut down the costs of the extra features by helping you whittle down what is most important to you. It’s also much easier to change in the future should your wants/needs change. Direct Connection With Police. Professional home security systems will contact police and/or the fire station should your emergency need them. It is a great asset to have that phone call placed that much faster and potentially save your home, valuables and in some cases your life. Monitoring services. Your home security company will have someone to monitor your system for you, making it easier to leave on that business trip or vacation you have planned. Constant monitoring allows your system to respond to things like carbon monoxide leaks, house fires, intruders or even something such as a flood and get you the help you need faster so that you can minimize the damage to your home. Discount on homeowners insurance. Most insurance companies will give you a discount on your coverage if you have a professional security system, with even deeper discounts availables for those whose systems have more features. On average, homeowners can receive a 10-20% discount when they have a professional system installed and functioning. Keep an eye on your home when you’re away. Many professional security systems offer free apps that allow you to check in on your house all through the comfort of your cell phone. Some systems allow you to turn lights on/off, change the temperature in a room, or even watch in on the kids or babysitter while you’re away. Cost. Depending on the size of your home, a professional company can be more expensive. Definitely look into both options before making a decision. Contracts. Most security companies will come with monthly or yearly contracts that aren’t as easy to get out of. If you are looking for a short term option or a trial period than a DIY system might be a better option.